The last time I was in Bandung was back 1988. Yeap.. ages ago. I was too young to remember everything. Only littles snippet here and there. My late dad and his friends had organized a family vacation to Jakarta-Puncak-Bandung and I remember there being like 5 or 6 families on the tour. I dont remember Jakarta much (I was what.. 8?) only that there were a lot of poor children with plastic bowls in their hands, shoving them up to my face. And I remembered asking my dad why they were trying to give me their toys. *slapforehead* And the nauseous bus ride to Puncak. Then Bandung. Then up Tangkuban Perahu. So since the husband is not keen on Jakarta, I suggested Bandung. And so we flew into Bandung via Air Asia. Landed safely in Husein Sastranegara Airport. (Nama macam gah… sampai airport… kwang3x) Cleared immigration pretty quickly and found ourselves outside the airport, not knowing how to get to our hotel. After snubbing out his first ciggy, hubb grabbed my hands and crossed over the road to what looks like abus/taxi terminal. He approached someone in what we believed was a taxi uniform and asked for a taxi to our hotel. He offered us a flat rate of idunrememberhowmuch and told us to wait. About 5mins later, the taxi arrived and in good timing coz it started to drizzle and by the time we left the airport grounds, it began to rain heavily. We arrived at Novotel hotel about 30mins later. I love this hotel because the room we booked is spacious. Modern and super clean. On the 10th floor, we pretty much had a sweeping view of Bandung city. And free wifi! Dumped our stuff in the room and walked out to try and find lunch. And maybe a tour operator who could bring us to Tangkuban Prahu the next day. 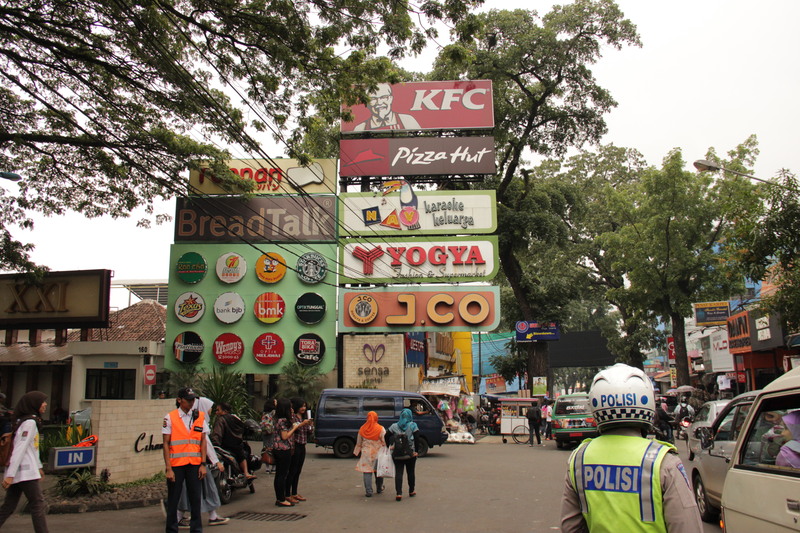 We took a map from the front office counter and figured we could walk to the nearest shopping mall, Cihampelas in Ciwalk. The receptionist told us the roads are gonna be jammed anyway. We could walk for about 10mins. Sure…. we reached there in 20mins. I have a sensitive tummy so we avoided the street stalls and the infamous brownies. 😦 They looked yummy tho. Had lunch in one of the restaurants and walked around the mall. Very moderns hence the prices were fixed and very comparable to SG. So didnt buy anything. On the way back, as we walk down Paris Van Java, we bought some tidbits, kerepeks and merepeks (thats junkfood btw. in my lang. :p) and walked back to the hotel.